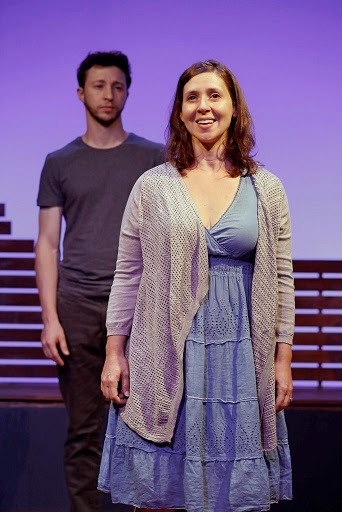 Henny Russell and Will Dagger in "Napoleon in Exile," one of six plays in the "Summer Shorts" festival presented by Throughline Artists at 59E59 Theaters. Photos by Carol Rosegg. FASHIONS change, but as the song says, "We wear short shorts." Covering everything with a tight little pair is a challenge. This season, some are more a Bermuda shorts length. Only one is of a below-the-knee style. None would be considered really short shorts, which is not to suggest that most of the "Summer Shorts" in repertory on two bills – Series A and Series B – are anything but crisp and stylish. The set design by Rebecca Lord-Surratt is all-purpose clever. It serves for the six plays with only minor alterations made by stagehands between playlets. "Sec 310. Row D, Seats 5 and 6," written by Warren Leight, is of the comfortable, if casual style. Over many painful seasons watching the New York Knicks, three become friends, framing the story in "Sec 310..."
Miriam Silverman and Adam Green in "The Riverbed." It's funny and extremely well-played by Peter Jacobson, Geoffrey Cantor and Cezar Williams under the direction of Fred Berner. This one is a genuine crowd-pleaser. Neil LaBute's "The Mulberry Bush" captures the spirit of less is more. It is a neat and well-orchestrated one-act drama directed by Maria Mileaf. Victor Slezak and J.J. Kandel (also executive producer of " Summer Shorts") unravel a fascinating tale with finesse and understated daring. Another highlight is "Riverbed,” written by Eric Lane and directed by Matthew Rauch. It uses alternating monologues to give witness to tragedy. Adam Green and Miriam Silverman imbue the story with life in admirable performances. 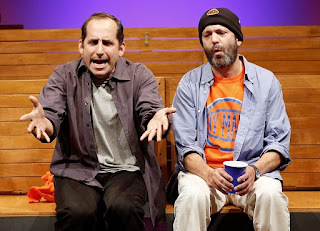 Peter Jacobson and Geoffrey Cantor in "Sec. 310, Row D, Seats 5 and 6." This reviewer's favorite is "Napoleon in Exile,” written by Daniel Rietz and directed by Paul Schnee. 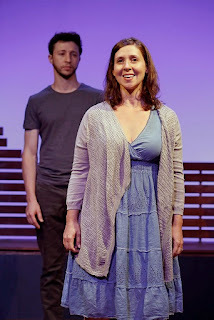 The drama is a moving exchange between Henny Russell and Will Dagger as mother and son at a crisis crossroad.